Almanac Art: Footy and art? Footy IS art! We all know that footy is art – don’t we? Well we should. If you have any doubts, think of the Dewey Decimal System. Get down to your local library and track down books about the great Australian game. Where will you find them? In the 700s. What do the 700s represent in the Dewey Decimal System? Art! Old Melvil Dewey knew what he was on about. Still not convinced? In that case, head on down to Red Gallery in North Fitzroy before August 6 and see for yourself that footy truly is art. Curated by Kim Wall, the gallery’s current exhibition, “Redball”, brings together a fine group of Australian artists and displays some of their finest Australian football related works. Well known for his “Big Week in Sport” pieces in the Sunday Age, Jim Pavlidis has several works on display, including his classic, “Bob Murphy – Finals 61 Revisited” but there are also some great works from names well known in the arts sphere but perhaps less so in the field of footy. Dave Bowers (a mate of mine since kinder days) has produced some of my favourite works of the show, his ‘Drop Punts Not Bombs’ pieces featuring champion players at full kicking stretch wonderfully evocative of the Scanlens’ footy card days. 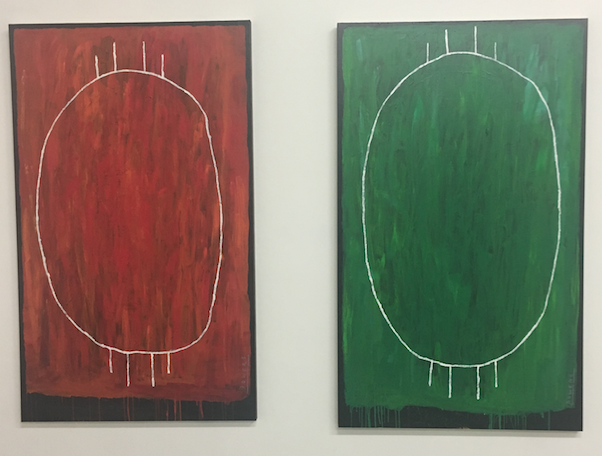 Bowers has done three such pieces, featuring Collingwood, Richmond and Footscray players for this exhibition, and will be continuing the series to include each of the 12 traditional VFL clubs. Even more imposing are Bowers two large pieces, Wangkatjunka Oval and Warragul Oval, that remind us of how huge and sparse footy fields can seem at times. Another of my schoolmates, Michael Weldon, has produced a fine portrait of the only person I’ll ever publicly admit to having a man-crush on, Bob Murphy. 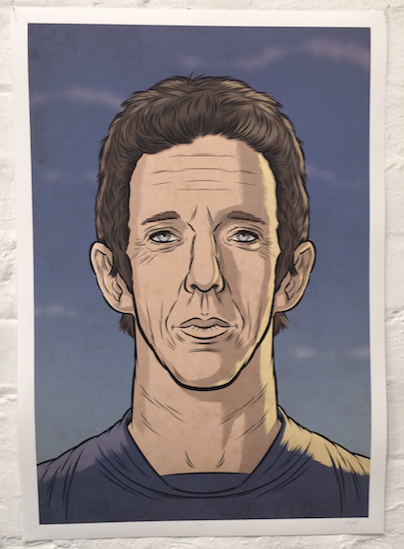 The Bob Murphy portrait by Michael Weldon is an archival digital print (A3 size), which is for sale. Price on request. If interested please contact Gigs at andrew.gigacz@gmail.com. Kim Wall herself has created several portraits of a different kind, again inspired by the old Scanlens’ footy cards. 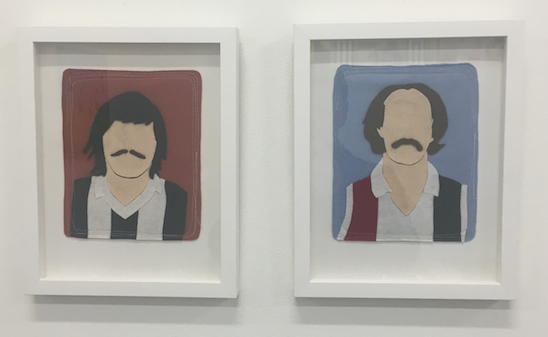 They are simple creations of wool felt on rag paper but anyone who was around in the late ’70s or early ’80s will know exactly who the players are. 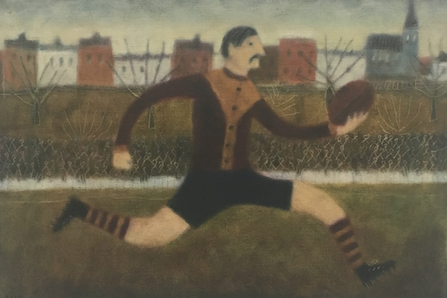 There are heaps of other great pieces by a host of footy-loving artists, including Nick Howson (who did the brilliant 2009 Footy Almanac ‘Buddy’ cover, Ainsley Waters, Ian Westwood and many more. Wednesday to Saturday 11:00am – 5:00 pm). It’s pretty much half way between Brunswick Street Oval and the North Fitzroy Arms. What better location to celebrate the art of footy!